ThinkSTEAM: Can you tell us little bit about yourself and where you grew up (background, etc.)? Sara Volz: I grew up in Colorado Springs, Colorado, where I spent my time variously reading fantasy novels, performing musical theater, and playing with my cats. When I was young, my planned future career was either an astrophysicist (due to a book I read about black holes) or a Broadway actress (due to the amount of time I spent running around the house singing). As it happens, biochemistry seems to suit me just fine! ThinkSTEAM: When did you first become interested in science? What were your first experiences with science? Sara Volz: My first-ever “science project,” entitled “Which Freezes Fastest—Water, Milk or Juice?”, won my school’s kindergarten division by dint of being the only entrant. I had no idea I would go on to pursue a career in research at that point! I also have fond memories of visiting the Denver Museum of Nature and Science, especially the astronomy exhibits, and going to local “Cool Science” demonstrations with liquid nitrogen and flashy chemicals. ThinkSTEAM: Can you briefly describe your research in algae biofuel? Sara Volz: The goal of my work was to make algae biofuels a more feasible option by increasing algae oil yields, and thus fuel production. After a few years of simpler experiments, I had the idea to use artificial selection—guided evolution—to isolate populations of algae with high oil production. I treated cultures with an herbicide that kills algae with low oil production by blocking a very important enzyme in oil synthesis. Instead of trying to use difficult, complex genetic approaches or environmental techniques with undesirable side effects, this strategy selects for cells with high oil production, by making such overproduction necessary for cells to survive the effects of the herbicide. ThinkSTEAM: What inspired your research in algae biofuel? Sara Volz: I’d been interested in biofuels since seventh grade, when I heard about neighbors making biodiesel in their garage. After researching the issue on my own, in ninth grade, I realized how algae can be used as a source of the oils for biodiesel—a much better option than soy or corn because it is a more efficient oil producer and can be grown on non-arable land. I’ve been working with algae ever since: it’s a perfect fusion of my passions for alternative energy and biochemistry. ThinkSTEAM: What are some of the obstacles you faced with your research? Sara Volz: My experience has definitely taught me to be persistent even in the face of seeming failure—I’ve learned to press on through a wide variety of challenges and disappointments, and now truly believe that what may seem like near disaster should be assessed for what I can learn, flaws I can correct and facets I can polish. It was very difficult for me to find mentorship and access to a lab I could visit regularly—it took a lot of persistence and flexible planning to make my project work. Eventually I realized I really just needed to conduct much of my work at home. I spent a good portion of my high school career begging, borrowing, and stealing saving for the materials to convert my room into a homespun laboratory. The result came complete with an appallingly clattery old centrifuge, glassware I got for my birthday, a microscope I got for Christmas, a rather handsome set of micropipettes, and, of course, the requisite bubbling flasks of green goo! ThinkSTEAM: What was it like to win the Intel STS in 2013 and be mentioned by President Obama at the White House Science Fair? Sara Volz: It felt completely unreal—even now, three years later, I can still barely believe that happened. I felt so incredibly lucky, honored, and excited to be an STS finalist in the first place. The President mentioned that I had a home laboratory and said I must have very tolerant parents! He wasn’t wrong, but my parents still won’t let me hear the end of it. ThinkSTEAM: Can you tell us about the research you have been doing in MIT? Sara Volz: At MIT, I’ve been working in the field of genome engineering on a technology called CRISPR. Basically, it’s a “find-and-replace” system for DNA! The system relies on a nuclease (a protein that cuts DNA) that uses an RNA template to match to a DNA site. The nuclease scans the genome looking for a match to its RNA companion, then cuts DNA at the requisite place. From there, researchers can edit the gene, remove it entirely, or even add a new gene. My research focuses on making these tools more efficient and more versatile—for example, improving the specificity of the nuclease, or making it able to be turned on and off. ThinkSTEAM: What is your advice for middle school girls who are interested in STEM? 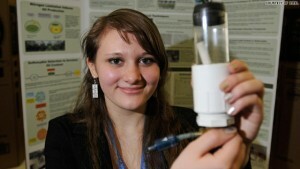 What is your advise for high school girls who are pursuing science research? Sara Volz: If you have questions or wonder about our world then you have already taken the first step. Science isn’t boring or the tedious memorizing of facts, it’s the process of trying to figure out the world around us, asking a testable question and finding more questions. I would encourage any young person remotely interested in inquiry and discovery to just start exploring a question you wonder about. Ask your parents and your teachers to help you if you need resources. Search for background information on the internet. Do everything you possibly can yourself – try to answer your questions in ways that don’t require a fancy lab or specialized processes or equipment. When you get to the point that you really know something you want to investigate but do need some more specialized help then don’t be afraid to ask some researchers for help. Be considerate—prepare well first, but then politely email the appropriate people to see if someone might be able to help you. Don’t waste researchers’ time, but don’t be afraid to ask for reasonable help after you have studied the topic and understand what you need to for trying to answer your questions. Many professors are very receptive to inspired, informed students! Plenty even accept high school interns. Most importantly, don’t let anyone—not even yourself–tell you you’re too young.